We have expertise in both small and large scale environments, and due to a strong background in Linux we can implement a system, where virtualization, operating systems and applications work together in the best possible way. We also train users for the administration of the system, if that is needed. Seravo is a member in the Open Virtualization Alliance. Our sister company has also used Xen virtualization based on Linux for hosting since 2003. Why choose virtualization based on Linux? 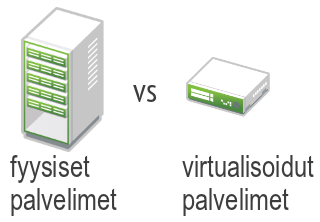 Virtualization helps you to bring down the infrastructure costs. With virtualization it is possible to manage the amount of hardware that is in use, lower the use of electricity, and to automate some functions, which means that personnel resources can be used for more active tasks than mere administration. With virtualization the company can have a better precognition of what kind of a budget is needed for electricity, hardware space and personnel. Since servers have to be designed for load peaks, most of the time most of their capacity remains unused. By virtualizing several computers into a single computer, it is possible to reach a situation, where the usage level of equipment is high, but there is still capacity for the load peaks of the individual servers. When the amount of equipment is lower, other advantages are reached as well, when physical space is freed, use of electricity is lowered, and the amount of malfunctioning computers is minimized. Virtualization can be implemented for desktop computers as well. The IT manager of the Kankaanpää city received a Linux award for taking desktop virtualization into use. If you use VMware or Hyper-V, it is useful to get acquainted with Linux virtualization and the support services we offer. Traditionally Linux virtualization systems have been the underdog in usability, but the new administration tools have in some areas even surpassed the competitors.